In part 1, we covered the kennel door. Part 2 in our Dog Kennel Designs and Configurations is all about dog kennel panels (side and back). The look of your facility is a personal preference, unless you are an animal shelter/control organization then you may be limited on your input, but let’s assume the decision making is yours. You can choose from stainless steel panels (which are usually used for isolation), or something more colorful, usually some form of plastic. 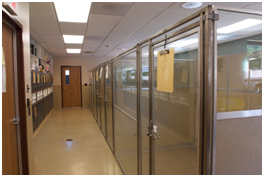 Most kennel manufacturers offer a couple of different types of material. It’s important to educate yourself on what these materials are and how well they will hold up in an animal care facility. It’s also important to ask how the kennel panels are installed. 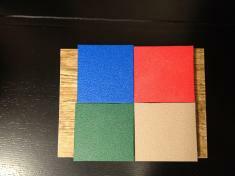 Is it one piece of solid material or is it thinner pieces of material sandwiched together with foam or wood in between? Construction is just as important as material selection when it comes to dog kennels and always ask your potential manufacturer for a long list of references, preferably some local to you so you can drive out and look at the equipment up close and ask the individual what they like and what they do not like. What they do not like is often where the kennel differs from others. Our dog kennel panels are offered in stainless steel and Starlite (HDPE). The stainless panels are great for isolation or if you’re going for a very modern look and feel, but most of our customers opt for the high density polyethylene. It’s similar to cutting board material and has many benefits. It is abrasion, moisture, stain and odor resistant, FDA, NSF and USDA approved for its closely packed structure and chemical resistance. It’s an ideal application for dog kennel panels which will endure daily abuse from the dogs and daily cleaning from their keepers. We use a special thickness which yields high impact strength and resists scratching. We offer these dog kennel panels in 4 standard colors, blue, red, green and clay. We also offer a dog kennel guillotine door to assist with animal transfer for cleaning or moving a dog from indoor runs to outdoor runs. These guillotines can be installed in our kennel back panel or side panel. You can read more about the guillotine in another blog. The more I see of the dogs, stars of SP Kennel, the happier I get (not a refenerce to Hapeeee!!!)! This is THEIR WEBSITE – WOOF!!! As it should be – they are sooooo precious.And thanks again to new and terrific portraits, the slideshow of favorite pictures past, and especially to talented web designer Macgellan for this joint labor of love with SP-two legged folk!